Staphylococcus aureus is capable of causing numerous types of infections in humans that range from mild to serious. Indeed, S. aureus can cause minor skin infections such as boils or it can cause more serious infections that result in clinical manifestations such as endocarditis, osteomyelitis, arthritis, septicemia, and toxic shock syndrome, among others, as well as infections of surgical wounds. What is more, S. aureus is known as one of the so-called superbugs, because of the pathogenic nature of the bacterium combined with the fact that it frequently acquires resistance to many currently used antibiotics. Methicillin resistant S. aureus, or MRSA, is one of the most notorious pathogens in the hospital environment and the spread of community acquired MRSA is now becoming prevalent. How does MRSA scavenge nutrients during infection? how does MRSA regulate nutrient source preference? how does mrsa liberate nutrients from the host? How does inhibiting nutrient acquisition pathways affect the outcome of MRSA infection? Goncheva MI, et al. 2019. Stress-induced inactivation of the Staphylococcus aureus purine biosynthesis repressor leads to hypervirulence. Nature Communications 10(1):775. Kaiser JC, King AN, Grigg JC, Sheldon JR, Edgell DR, Murphy MEP, Brinsmade SR, Heinrichs DE. 2018. Repression of branched-chain amino acid synthesis in Staphylococcus aureus is mediated by isoleucine via CodY, and by a leucine-rich attenuator peptide. PLOS Genetics Jan 22; 14(1):e1007159. Laakso HA, Marolda CL, Pinter TB, Stillman MJ and Heinrichs DE. 2016. A heme-responsive regulator controls synthesis of staphyloferrin B in Staphylococcus aureus. Journal of Biological Chemistry 291: 29-40. The success of Staphylococcus aureus as a pathogen is partly attributable to its ability to thwart host innate immune responses, which includes resisting the antimicrobial functions of phagocytes. 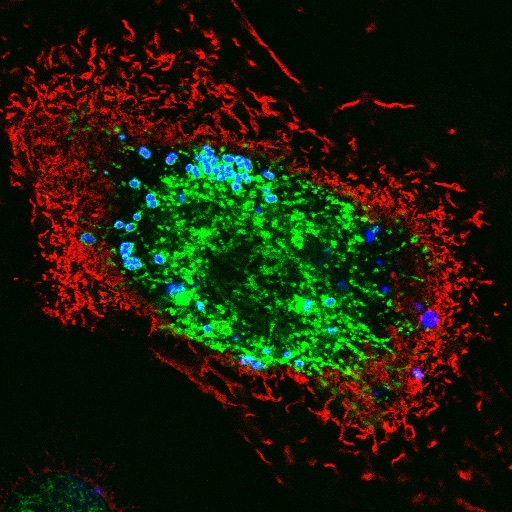 Macrophages are key phagocytic cells that typically eradicate infecting pathogens - however, research from the Heinrichs Lab demonstrates that macrophages fail to control intracellular infection by MRSA. Indeed, intracellular staphylococci proliferate while the bacteria are residing in mature phagolysosomes hours after initial phagocytosis. how do macrophages restrict mrsa's access to nutrients? how does mrsa obtain nutrients during intracellular growth? how does mrsa resist the antimicrobial functions of macrophages? Flannagan RS & Heinrichs DE. 2019. A fluorescence based-proliferation assay for the identification of replicating bacteria within host cells. Front. Microbiol. Dec 12;9:3084. doi: 10.3389/fmicb.2018.03084. Flannagan RS, Kuiack RC, McGavin MJ, Heinrichs DE. 2018. Staphylococcus aureus uses the GraXRS regulatory system to sense and adapt to the acidified phagolysosome in macrophages. mBio. Jul 17;9(4). pii: e01143-18. doi: 10.1128/mBio.01143-18. Flannagan RS, Watson DW, Surewaard BG, Kubes P, Heinrichs DE. 2018. The surreptitious survival of the emerging pathogen Staphylococcus lugdunensis within macrophages as an immune evasion strategy. Cell Microbiol. 2018 Jun 14. doi: 10.1111/cmi.12869. Staphylococcus lugdunensis is a coagulase-negative staphylococcal species (CoNS) that may be found as a component of the commensal flora on human skin. However, unlike other CoNS, S. lugdunensis has a heightened capacity to cause infection displaying virulence properties that in some respects resemble the prolific pathogen S. aureus. Unfortunately, the true burden of S. lugdunensis infection remains unknown due to misidentification of a fraction of clinical isolates as S. aureus. Akin to S. aureus, S. lugdunensis can cause infections that range from relatively minor skin and soft tissue infections to more serious conditions such as bacteremia, and infective endocarditis. Additionally, infective endocarditis attributed to S. lugdunensis infection can be associated with significant tissue damage and elevated mortality emphasizing the virulent potential of this pathogen. Moreover drug-resistant S. lugdunensis strains with heightened resistance to beta-lactam antibiotics (e.g. oxacillin and methicillin) have emerged which could complicate treatment of infection. Remarkably, despite the recognized clinical significance of S. lugdunensis few virulence factors have been identified and the interaction of S. lugdunensis with immune cells such as macrophages has remained unexplored. The observation that S. lugdunensis can cause serious infection akin to S. aureus suggests that S. lugdunensis overcomes nutritional immunity as well as the innate immune functions of cells such as macrophages. We are investigating the mechanisms by which S. lugdunensis obtains nutrients such as amino acids and iron, as well as the fate of S. lugdunensis after phagocytosis by murine and primary human macrophages. These investigations are a way to begin to understand the interaction with this enigmatic bacterium with the host. Heilbronner S, Monk IR, Brozyna JR, Heinrichs DE, Skaar EP, Peschel A, Foster TJ. 2016. Competing for iron: duplication and amplification of the isd locus in Staphylococcus lugdunensis HKU09-01 provides a competitive advantage to overcome nutritional limitation. PLoS Genetics. 12: e1006246. Kaiser JC, Heinrichs DE. 2018. Branching Out: Alterations in Bacterial Physiology and Virulence Due to Branched-Chain Amino Acid Deprivation. mBio. Sep 4;9(5). pii: e01188-18. doi: 10.1128/mBio.01188-18. Sheldon JR, Laakso HA, Heinrichs DE. 2016. Iron acquisition strategies of bacterial pathogens. Microbiology Spectrum. 4(2). Flannagan RS, Heit B, and Heinrichs DE. 2015. Antimicrobial mechanisms of macrophages and the immune evasion strategies of Staphylococcus aureus. Pathogens 4: 826-868. Sheldon JR, Heinrichs DE. 2015. Recent developments in understanding the iron acquisition strategies of gram positive pathogens. FEMS Microbiology Reviews. Jul;39(4):592-630. The Heinrichs lab is grateful for the funding sources below that support our research and scientific education.